Shown here: Single mirror image pallet / cover and fibreboard sidewall with sleeve locking devices. 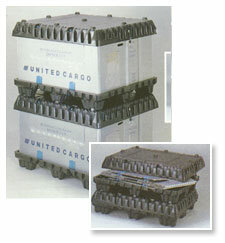 Industry’s largest selection of collapsible container sizes. 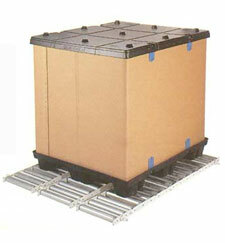 Single sheet and twin sheet stackable and nestable pallets / covers. Plastic and fibreboard sidewalls designed and manufactured for any application. Shown here: Conveyorable twin sheet pallet and cover and fibreboard sidewall with sleeve locking devices. Heavy duty and specialized designs available. 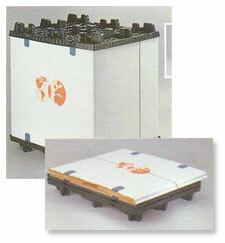 Shown here: Twin sheet pallet and cover and plastic sidewall with sleeve locking devices. Self contained designs protect collapsed sidewalls and save space. Sleeve locking devices elininate need for banding and provide tamper evident seal.